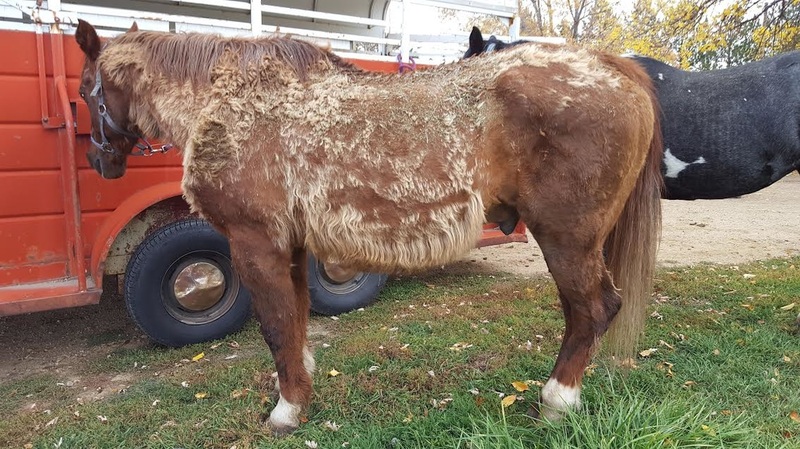 Equine Cushing’s disease is a disorder of the pituitary gland that results in hormonal imbalances, causing a variety of clinical signs: a long, wavy haircoat that fails to shed according to normal seasonal patterns; excessive sweating; lethargy and poor athletic performance; chronic recurrent laminitis; infertility; weight loss; muscle wasting, especially along the topline; abnormal distribution of fat, with accumulations in the crest of the neck, tail head, sheath and above the eyes (usually associated with concurrent Equine Metabolic Syndrome or EMS); consumption of large volumes of water and passage of large amounts of urine; delayed wound healing; and increased susceptibility to infections. The disease tends to occur in middle-aged and geriatric horses, with an average age of approximately 20 years at the time of diagnosis. Without treatment, symptoms tend to worsen over time and many horses are euthanized as a consequence of laminitis, recurrent foot abscesses or complications related to bacterial infections. In advanced cases characterized by a long, wavy haircoat and other classical signs of Cushing’s disease, diagnosis is relatively straightforward and may not require any specialized testing for a definitive diagnosis. Diagnosis of early cases or those characterized by few obvious clinical signs can be more difficult. There are two tiers of testing for those cases. Tier one, the simplest approach, is the measurement of plasma ACTH concentration. The ACTH test involves collection and analysis of a single blood sample; the pituitary gland in affected horses often secretes excessive amounts of ACTH into the bloodstream as compared to normal horses. There is a natural seasonal variation in the levels of plasma ACTH with higher levels attained August to October. For this reason we have different acceptable normal ranges depending on the time of year. The preference is to test during the late summer and autumn as the physiological alterations serve as a natural stimulation test. Tier two is the thyrotropin-releasing hormone (TRH) stimulation test. This test involves a baseline blood collection, administration of a synthetic TRH, with a second blood sample collected 30 min later. Both samples are then used to quantify plasma levels of ACTH. The TRH is not readily available from the usual distributors, making this test not preferential. If using this test, it is recommended to test between November and July. Optimal management of Cushing’s disease involves a combination of both specific medication to normalize the function of the pituitary gland and supportive care to address and prevent complications associated with the disease. In both cases, management will be life-long as there is no way to reverse the disease process. Aside from medications, feeding strategies are important in these patients as they can present as either thin or overweight. Those that are overweight often have characteristics of EMS as well as Cushings. When thusly affected, the horses are often insulin resistant so sweet feed and other feed high in soluble carbohydrates should be avoided in favor of diets emphasizing fiber and fat. Pelleted or extruded feeds designed specifically for older horses are strongly recommended, but those with high levels of sugar or molasses should be avoided unless needed to encourage the horse to eat.